A View of Osman Manzil, named after H.E.H. the Nizam of Hyderabad, the main building in Zawiyat Hindiyyah, Palestine, 1945. © Ahmad al-Ansari. At the dawn of the twentieth century, British India contained slightly over 70 million Muslims–more than the collapsing Ottoman Empire. The Indian Muslim elite—of which many claimed descent from various Arab, Iranian and Turkish ethnicities—were always conscious of membership in trans-Indian, pan-Islamic world ummah beyond the borders of their own homeland. Trade and pilgrimage to the Haramayn Sharifayn in Hijaz, Jerusalem in Palestine, Karbala and Najaf in Iraq, kept a steady, annual stream of Indian travel to and from the Middle East. In addition, some Muslim princely rulers such as the Nizam of Hyderabad welcomed migrants from Hijaz and Hadramawt to settle in his Dominions from late eighteenth century. The Indian Muslim elite maintained deep interest in the affairs of the Ottoman Empire, considering it to be the last vestige of Muslim political power as the rest of the Islamic world had been colonized or controlled by the European powers. The Indian Muslims’ interest in the Ottoman Empire manifested in at least four ways. 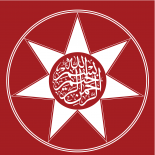 One was through political support to the independence and territorial integrity of Ottoman Empire as shown by the Khilafat movement; the second was financial support to projects like the Hijaz Railway; the third was the monetary aid for relief from natural and man made calamities in the Empire, and fourth, through financial assistance to the advancement and preservation of Muslim religious and cultural institutions. Indian Muslim financial support to the Haramayn Sharifayn, Karbala and Najaf is manifested by the Nizam of Hyderabad’s involvement in the preservation of the Prophet’s Mosque in Madina and Awadh nawabs in Shiite shrines. In 1924, the Nizam deputed an engineer to undertake the repairs to the Prophet’s mosque in Madina. The Shiite nawabs of Awadh in northern India gifted endowments for the shrines in Najaf and Karbala. A View of Zawiyah Hindiyyah, 1945. © Ahmad al-Ansari. This article is concerned with Indian Muslim support to the projects of religious and educational purposes in one part of the former Ottoman Empire, Palestine during the British Mandate, from 1918 to 1948. In Jerusalem, Indian Muslim presence dates back to thirteenth century CE, exemplified by the case of Zawiyat al-Hindiyyah or Zawiyat Faridiyyah. With the spread of Sufism in Jerusalem during the 16th Century, many Sufi centers or Zawiyas were established to accommodate the followers of Sufi Orders. There were over 70 Sufi orders in Jerusalem at the time. The Indian Sufis of the Chishti order took the “Chilla” (the word stems from the Persian, Urdu word for the 40, symbolizing the number of days spent in seclusion in prayers) where Shaykh Farid al-Din spent 40 days, as a meeting place for them, which was originally the Zawiyah of the Rifai Order. The Indian Sufis purchased this piece of land and declared it as Waqf in the name of Shaykh Farid, later on the Indian residents purchased the surrounding lands to be as a Waqf as the Takiya Faridi in Jerusalem. This Zawiyah is thus named after Farid al-Din Mas’ud, (1175-1265), a Sufi shaykh hailing from the Punjab province in northern India. Farid al-Din Mas’ud is also known by his Persian/Urdu honorific Ganj-i Shakar, repository of sugar. The Zawiyah, now a public, non hereditary utility Waqf property measuring nearly 1.5 acres is a prime real estate site meant as a home for visiting Indians. The Islamic Higher Council of Jerusalem is the overall supervisor of all waqfs including the Zawiyah. The Zawiyah has been extensively documented. The medieval traveler Evliya Chelebi identified it as one of the largest Zawiyahs in the city in 1671. The old structure was largely replaced by a new building in 1869-1870, according to Taysir Jabbarah. In 1922, Hajj Amin al-Husayni (1895-1974) requested the Indian Khilafat movement leader Mawlana Muhammad Ali (1878-1931) to send someone to look after the Zawiyah. Consequently, Khwaja Nazir Hasan Ansari (1880-1951) of Saharanpur, U.P. arrived in Jerusalem in 1924 to look after the Zawiyah. 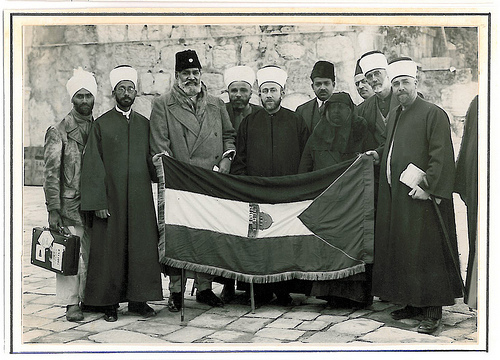 Hajj Amin (center) presenting Palestinian flag to Mawlana Shawkat Ali, (left of Hajj Amin) a leader of Indian Khilafat movement; next to Shawkat Ali is Shaykh Khwaja Nazir Hasan Ansari, 1931. © Ahmad al-Ansari. Upon arrival, he found “the Hospice in a dilapidated condition with a few old houses which were later badly damaged during the 1927 earthquake.”  Ansari made several trips to his native India to raise funds for the rebuilding of the hospice between the two world wars. In 1931-1940, Shaykh Nazir Hasan Ansari successfully raised money in India from the Nizam of Hyderabad, Mir Osman Ali Khan (reigned 1911-48), the Nawab of Rampur and the Nawab of Bahawalpur. The main building in the hospice was named as Osman Manzil after the Nizam’s name. 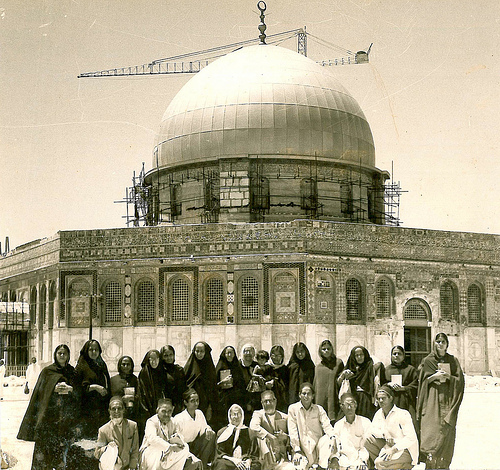 Indian Muslim pilgrims in front of the Dome of the Rock, in the center is Begum Mariyam Ansari, wife of Shaykh Khwaja Nazir Hasan Ansari, 1965. © Ahmad al-Ansari. The Israelis bombed the hospice during the air raid on Jerusalem on 9 June 1967 killing Khwaja Nazir Hasan Ansari’s wife, daughter Amena, and a six year old son Ahmad. At the Indian government’s request, the family was transferred to Beirut by the British Consulate in Jerusalem. Since 1992, the Indian government has been granting financial assistance to renovate, repaid and keep up this historical and religious monument. The financial assistance has been given to the Director and Trustee of the Indian Hospice Waqf. A series of distinguished Indians visited the Zawiyah since the 1930s culminating in the visit of Gujral in 1996, where he found the hospice to be “an oasis of Indian hospitality.” The current Director and Trustee of the Indian Hospice is Shaikh Muhammad Munir Ansari, son the late Khwaja Nazir Hasan Ansari who died in 1951. At the recommendations of the local councils and officials, his eldest son Munir was chosen to become the Director and Trustee. The Sharia Court in Jerusalem confirmed Munir’s position, a position he occupies since then. Evidently, the Zawiyah is only one of the many Indian Islamic (and some Indian Christian) endowments in Palestine. In the Islamic court of Jerusalem, Taysir Jabbarah found a record dated 1656 CE/1067 A.H. documenting a Waqf created by Salih, son of Jawhar al-Hindi al-Kashmiri. The Waqf in question was a house to accommodate pilgrims from Kashmir. Beyond Jerusalem, Indian Muslims purchased lands in Ramallah and Gaza dedicated as Waqfs. In Gaza town of Gaza Strip, on Sharia al-Zawiyah, located near Suq al-Khudaar near Omar Mukhtar Street are a number of shops built as waqfs for Zawiyat al-Hindiyyah. The Waqfs were created out of money given by Shaykh Nazir before 1948 to late Hasan Yusuf Abu-Shaaban. The official document of the Waqf is held by Ihsan Abu Shaaban in Gaza town. The income of the shops goes to Dairat al-Awqaf in Gaza. The former Indian diplomat in Ramallah, Zikrur Rahman has identified Waqfs in Gaza (the Indian mosque with attached shops), Haifa, Jaffa, Jusur Binat Yaaqub, Lod, and is documenting Indian Muslim and Indian Christian endowments in all parts of Palestine, before and after 1948 to inventory the Indian legacy in the Holy Land. As noted earlier, India’s Muslims constituted the largest segment of the Muslim ummah until the partition of the subcontinent in 1947. Before the era of large scale oil revenues in the Middle East, many in the Arab world looked up to India’s rich princes and businessmen for financial aid for religious and charitable projects. 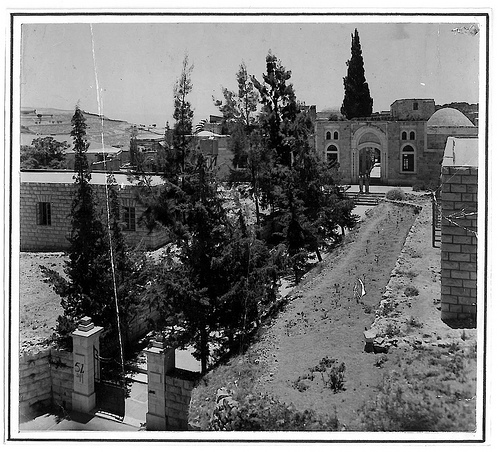 A Palestinian delegation to the Hijaz allegedly issued an appeal in 1922 to “India and other Muslim countries to help foil an attempt to convert the al-Aqsa Mosque into a place of worship for Jews,” consequently “fears of an intense Pan-Islamic response to this matter threw the British Colonial Office into a dither.” It was under these circumstances that a three man Palestinian delegation headed by Jamal al-Husyani (1892-1982), Secretary of Palestine Muslim-Christian Association visited India from November 1923 to June 1924 to collect funds for the restoration of the al-Aqsa Mosque. The other two members of the delegation were Shaykh Muhammad Murad, Mufti of Haifa and Shaykh Ibrahim al-Ansari. In addition to the first delegation, Hajj Amin himself headed another delegation that went to India via Syria, Iraq and Kuwait. The Palestine High Commissioner sent a message to his counterpart in Iraq asking him to assist the delegates in Baghdad and Indian cities. During this trip Hajj Amin collected some funds which were sent through the High Commissioner of Palestine to the SMC. The visit also provided Hajj Amin to build lasting bonds with Indian Muslim elite leadership. Thus he visited India again in 1933, 1952 and 1961. He also had close ties with the leaders of newly created Pakistan in the late 1940s till his death in 1974 in Beirut. 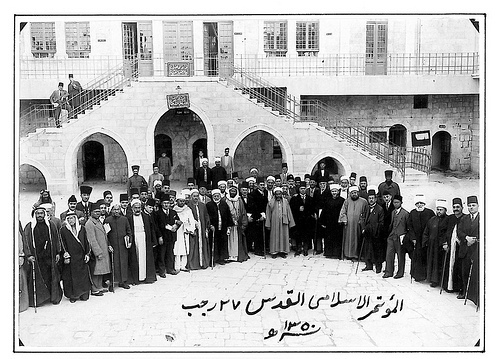 Leaders attending the World Islamic Congress, Jerusalem, 1931. 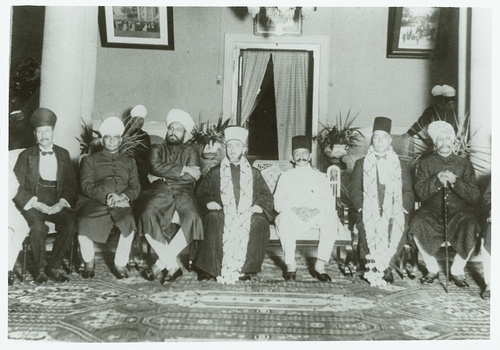 From right, Riyad al-Sulh, a prime minister of Lebanon, fourth, Mawlana Shawkat Ali, leader of the Indian Khilafat movement, ninth from right is Hajj Amin; third from left is Shukri al-Quwatly, a President of Syria. © Ahmad al-Ansari. During the three decades of British Mandate in Palestine (1918-48), twenty-one assets were turned into Waqfs. The largest of them was the donation of the Nizam of Hyderabad. The man who was instrumental in getting the donation was Hajj Amin al-Husayni (1895-1974). Hajj Amin was appointed by High Commissioner Herbert Samuel as Grand Mufti of Jerusalem on 8 May 1921, a post on which he remained until 1937. He was also appointed by Samuel as President of the newly established Supreme Muslim Council (SMC) in Jerusalem in March 1922. He led a campaign between 1928 and 1929 rousing the Arabs of Palestine to stand against the threat to the Muslim holy places in Jerusalem. Hajj Amin took his campaign beyond the border of his native land to neighboring Trans Jordan, Syria, Iraq and India. Accompanied by the Egyptian Pan-Islamist Muhammad Ali Allouba Pasha, the Mufti arrived in Hyderabad on 21 July 1933. The duo was the guests of the state. Among others, the Mufti met Bahadur Yar Jang, (1905-44), the leader of Muslims in Hyderabad, and a steadfast supporter of the Palestinians who had met the Mufti in Jerusalem earlier. 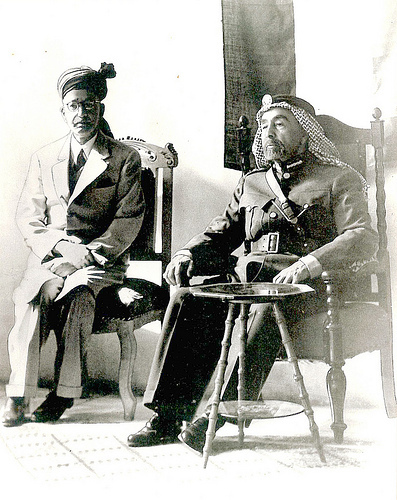 Shaykh Nazir Hasan al-Ansari calling on H.M. King Abdullah of Trans-Jordan during the first visit of the King to Jerusalem, 1949. © Ahmad al-Ansari. After the visit, the Mufti wrote a long letter to the Nizam on 27 July thanking him for his philanthropy for the al-Aqsa project. 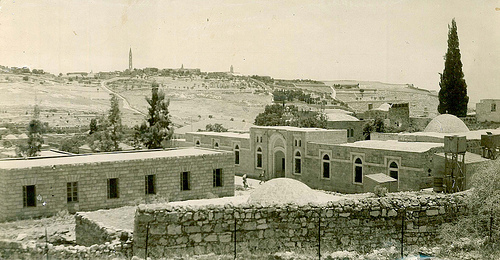 The Mufti further requested the Nizam as a pious Muslim ruler to donate funds for a projected Islamic university in Jerusalem, which the SMC had resolved to establish. The Nizam, whose fabulous wealth and famed generosity toward Islamic causes had spread outside India into the Middle East, obliged. Soon, correspondence ensued between the Prime Minister of Hyderabad and the British Residency, through which the colonial authorities compelled the Nizam to conduct his foreign affairs. Through British diplomatic channels, the Nizam contributed £7, 543 for the Islamic university. The sum was deposited in a bank and not sued until 1938. According to Yitzhak Reiter, “Hajj Amin al-Husayni used this money to purchase 1,000 donums [properly dunum, unit of land measure, four dunum equal approximately one acre or 1,000 square meters] of agricultural land in Kafr Zayta (in Tulkaram sub district) as part of the struggle over land purchases in Palestine, and to dedicate that land as a Waqf for the foundation of the Islamic university in Jerusalem (rather than using the funds directly for university, as the founder had intended). His purpose was to keep the land out of Jewish hands…The land purchase by SMC was to set a pattern fro the Muslim community to thwart land acquisition by Jews.” It is thus unsurprising that the Palestinian leadership of the time held a high regard for Indian Muslims. When Mawlana Muhammad Ali, the leader of the Khilafat movement in India and the staunch backer of the Palestinians died in London on 4 January 1931, Hajj Amin requested his survivors to bury him in the sacred precincts of Masjid al-Aqsa. Hajj Amin in Hyderabad, Deccan, India, July 1933. From right to left, Unidentified; Muhammad Ali Alluba Pasha, an Egyptian leader accompanying Hajj Amin; Maharaja Kishen Pershad; Hajj Amin, Nawab Bahadur Yar Jang; Sayyid Amiruddin’s maternal grandfather Syed Yusufuddin, Publisher, The Rahbar-e-Deccan Daily, unidentified. Unfortunately Hajj Amin, years after this meeting, decided to collaborate with the German Nazis during World War II, this decision is condemned and unacceptable. © Omar Khalidi. The idea of burying Muhammad Ali in Jerusalem was to “strengthen the attachment of Muslims all over the world to the sanctuary…and to encourage Muslims of India to look to Jerusalem as the seat of their religion equal to Mecca and Medina…The Mufti invited Muslims from abroad to come to Jerusalem to attend the funeral which was to be held on 24 January 1931. Attended by a large gathering of Muslim leaders, Muhammad Ali was laid to rest in the company of some of the most famous men of the time who lie buried in the same area: Ahmad Hilmi Abd al-Baqi, al-Shahid Abd al-Qadir al-Husyani, Musa Kazim al-Husyani, and Abd al-Hamid Shoman, founder of the Arab Bank. The funeral helped Hajj Amin achieve his purpose. Few Indian Muslims had visited Jerusalem before 1931, but after Muhammad Ali’s funeral, Indian Muslims visiting Jerusalem increased to hundreds. Shortly after Muhammad Ali’s funeral, the Hyderabad leader Bahadur Yar Jang came to visit the Mufti on 7 June 1931. Since then, there have been numerous Indian visitors to Jerusalem in general and to al-Haram al-Sharif in particular. In turn, some members of the Palestinian elite turned to the ruler of Hyderabad for aid for their projects in Jerusalem and elsewhere, inspired by the Nizam’s bequest to the restoration of al-Aqsa and the Islamic university project. This is exemplified by the pleas made to the Nizam for mosque building projects in London and Washington, D.C. The year 1948 was tragic both for Palestine and Hyderabad. The departure of British heralded a nationalistic era in Indian subcontinent and the Nehru administration demanded Hyderabad’s immediate accession to India, despite its distinct history and culture. Even while engrossed in complex negotiation with the Nehru administration, the Nizam announced a donation of “one million rupees (then US$300,000) for Palestine Arab refugees in response to an appeal by King Abdullah of Trans-Jordan,” on August 25, 1948 as reported by Reuters and published in international press. Through the activities of the Mufti and the fundraising in India for causes in Palestine, Jerusalem became firmly embedded in Indian Muslim consciousness as the first Qibla to which the believers had turned for prayers, and thus the third holiest city in Islam’s sacred geography. Thus, it is unsurprising that when an Australian madman tried to burn the al-Aqsa mosque on 21 August 1969, there was massive outrage all over India. One of the largest processions condemning the mosque burning took place in Bombay where an estimated 100,000 people poured out into the streets to demand action against the perpetrator. Despite the division of India into Pakistan and Bangladesh, the Muslims of the Subcontinent remain the most steadfast supporters of Palestine. The Indian government has changed its policy of supporting Palestinians since the early 1990s leading to a vast increase in cooperation between the military and intelligence establishments of Israel and India. However, the Indian Muslims remain firmly behind the Palestinians. The visit of Sheikh Ikrima Said Sabri, Mufti of Jerusalem to India in 1998 and the warm welcome he received was a reminder to everyone of the unbroken ties between Palestine and the Subcontinent. Author’s note: I am grateful to Dr. Salim Tamari whose fellowship at MIT in Spring 2009 inspired me to finish the research on Indian Muslim waqfs in Palestine; many thanks to Ahmad al-Ansari and to Aliya Khalidi for improving the text. 1. Omar Khalidi, “Sayyids of Hadramawt in Medieval and Early Modern India,” Asian Journal of Social Science 32, 2 (2004): 329-351, Arabic translation by AbuBakr Baqadir, in al-Masar (Virginia) 3:2 (2002): 59-74. idem, “The Hadhrami Role in the Politics and Society of Colonial India, 1750s-1950s,” pp. 67-81, in Hadhrami Traders, Scholars and Statesmen in the Indian Ocean, 1750s-1960s, edited by Ulrike Freitag & William G. Clarence-Smith, (Leiden: E.J. Brill, 1997). 2. Azmi Ozcan, “The Ottomans and the Muslims of India During the Reign of Sultan Abdulhamid II” pp. 299-303, in The Turks, v. 4 edited by Hasan Celal Guzel et al, (Ankara: Yeni Turkiye, 2002). 3. Azmi Ozcan, Pan-Islamism: Indian Muslims, the Ottomans and Britain, 1877-1924, (Leiden: Brill, 1997); Gail Minault, The Khilafat Movement: Religious Symbolism and Political Mobilization in India, (New York: Columbia University Press, 1982); A.C. Niemeyer, The Khilafat Movement in India, (The Hague: Nijohff, 1972). 4. William Ochsenwald, The Hijaz Railroad, (Charlottesville: University of Virginia Press, 1980), pp. 69-74. Syed Tanvir Wasti, “Muhammad Inshaullah and the Hijaz Railway,” Middle Eastern Studies 34, 2 (April 1998): 60-72. 5. Takashi Oishi, “Muslim Merchant Capital and the Relief Movement of the Ottoman Empire, 1876-1924,” Journal of the Japanese Association for South Asian Studies 11 (October 1999): 71-103. 6. Islam: Political Impact, 1908-1972: British Documentary Sources, V, edited by Jane Priestland, (Slough, UK: Archives Edition, 2004), p. 530, identifies Engineer Ata Husayn surveying the Prophet’s tomb in 1926. 7. Meir Litvak, “Money, Religion and Politics: the Oudh Bequest in Najaf and Karbala,” International Journal of Middle Eastern Studies 33, 1 (2001): 1-21; idem, “A Failed Manipulation: the Oudh Bequest and the Shii Ulama of Karbala and Najaf,” British Journal of Middle Eastern Studies 27, 1(2000): 69-89. 8. Taysir Jabbarah, al-Muslimun al-Hunud wa Qidyat Filastin, (Amman: Dar al-Shuruq, 1998), pp. 57-60. 9. Taysir Jabbarah, al-Muslimun al-Hunud wa Qidyat Filastin, op.cit. p. 57-60. 10. Ahmad Nazir Hasan Ansari, “How Jerusalem’s Indian Hospice Lost Hindi Touch,” The Milli Gazette (16-31 October 2007), p. 13. Ahmad Ansari is completing a thesis on Indian Islamic Heritage in Jerusalem, email from the author living in Beirut to the present writer dated 12 April 2009. 11. Information provided by Ahmad Ansari, Beirut, June 11, 2009. 12. I.K. Gujral, “Saga of Indian Hospitality in Jerusalem,” India Abroad (New York, 15 March 1996). 13. I.K. Gujral, “Saga of Indian Hospitality in Jerusalem,” India Abroad (New York, 15 March 1996). 14. Ahmad Nazir Hasan Ansari, op. cit. 15. Email from Dr Taysir Jabbarah, 10 March 2009. 16. Taysir Jabbarah, al-Muslimun al-Hunud, op.cit., p. 58. 17. Information provided by Ahmad Ansari from Beirut 11 June 15, 2009. 18. Conversation with Zikrur Rahman in New Delhi, 16 July 2009 at Arab Cultural Center, Jamia Millia Islamia. He is also publishing a book in Arabic entitled Alhind wa Filastin. 19. Sandeep Chawla, “The Palestine Issue in India Politics in 1920s,” pp. 27-42, in Communal and Pan-Islamic Trends in Colonial India, edited by Mushirul Hasan, (New Delhi: Manohar, 1981), p.29. 20. Muslim Outlook (Lahore) 7 June 1924, as cited in Sandeep Chawla, “The Palestine Issue in India Politics in 1920s,” pp. 27-42, in Communal and Pan-Islamic Trends in Colonial India, edited by Mushirul Hasan, (New Delhi: Manohar, 1981), p. 31, footnote 23, citing Colonial Office to India Office 4 August 1922, unpublished archival documents preserved in the British Library’s India Office Records. Further details in Taysir Jabbarah, al-Muslimun al-Hunud, op.cit. pp. 107-124. 21. British Viceroy Lord Reading’s Telegram to Secretary of State for India in London dated 7 August 1923, as cited in Sandeep Chawla, op.cit. footnote 39, page 39. 22. Taysir Jabbarah, Palestinian Leader Hajj Amin al-Husyani: Mufti of Jerusalem, (Princeton, NJ: The Kingston Press, 1985), p. 63. 23. British Resident at Hyderabad’s telegram to Political Secretary, Government of India 14 December 1923, as cited in Sandeep Chawla, op.cit., p. 29. 24. Nizam of Hyderabad’s letter and Ataturk’s response in Turkish Presidential Archives, located in the Presidential Palace, Ankara. I am grateful to Professor Yildirim Yavuz of Middle East Technical University for this valuable information. Email dated 10 June 2009. 25. Taysir Jabbarah alludes briefly to conflict between the clans, Palestinian Leader Hajj Amin al-Husyani, op. cit. p. 121.
http://www.isesco.org.ma/english/publications/Protection%20of%20islamic%… accessed on 6 June 12, 2009. Najm lists the amount of contributions received worldwide, which seems to have been obtained from p. 114 of Taysir Jabbarah, al-Muslimun al-Hunud, op. cit. For the documents in Hyderabad about the restoration, see Sayyid Dawud Ashraf, Awraq-i Muarrikh, op.cit. Chapter, Masjid-i Aqsa ki Maramat aur Tazin-i Nau, pp. 126-130. 28. Taysir Jabbarah, Palestinian Leader Hajj Amin al-Husyani, op. cit., p. 65. 29. Nadhir al-Din Ahmad, Sawanih Bahadur Yar Jang, (Hyderabad: Bahadur Yar Jang Academy, 1986), p. 298. 30. Taysir Jabbarah, al-Muslimun al-Hunud, op. cit. pp. 201-214. 31. Sayyid Dawud Ashraf, Awraq-i Muarrikh, (Haydarabad: Shugofa Publishers, 1998)., pp. 1091-114, the Urdu book’s chapter entitled “Filastin University ke Liye Giran Qadr Atiya,” is based on archival records in State Archives, Haydarabad, India. 32. Yitzhak Reiter, Islamic Endowments in Jerusalem under British Mandate, (London: Frank Cass, 1996), p. 68. 33. Taysir Jabbarah, Palestinian Leader Hajj Amin, op. cit., pp. 104-105. 34. Taysir Jabbarah, Palestinian Leader Hajj Amin, op. cit., pp. 104-105. 35. Taysir Jabbarah, al-Muslimun al-Hunud, op. cit. see the chapter Darih al-Zaim Mawlana Muhammad Ali al-Hindi fi Bahat al-Masjid al-Aqsa al-Mubarak, pp. 171-178. 36. Taysir Jabbarah, Palestinian Leader Hajj Amin, op. cit., p. 105. 37. Letter from Muhammad Said al-Husyani Al Abd al-Qadir, 14 February 1927, cited in Nadhir al-Din Ahmad, Sawanih Bahadur Yar Jang, op. cit. pp. 393-396. 38. London’s largest mosque began as Nizamia Mosque in 1936, see A.L. Tibawi, “History of the London Central Mosque and the Islamic Cultural Center, 1910-1980,” Welt des Islams 21 (1981):193-208; Islamic Cultural Center of Washington DC. 39. “Nizam Gives to Refugees Aid,” The New York Times (25 August 1948). 40. Omar Farooq, “Al-Quds Imam Gets Great Response in Hyderabad,” Saudi Gazette (19 December 1998), p. 12. This entry was posted on November 14, 2014 by ASFC in Uncategorized.